Exercise and immune function have a link. So can dietary beta-glucans – an immune boostertherefore be beneficial for high performing race horses as well? Researchers have put this to the test in French trotter horses. Keeping a horse’s immune system strong is crucial to maintain health and good performance. However, for many horses, the demands of training, performance, transport and travelling, weather conditions, parasitic and pathogenic pressure, or even herd dynamics raise the stress level of everyday routines putting the equine’s immune system under pressure. Young horses introduced to training as well as those involved in competitive events appear to be more prone to infections, as there is a relationship between exercise and immune function. Vaccination is optimal to prevent infectious diseases; unfortunately not all vaccines can prevent naturally occurring infections common in horses. Feeding with an eye on immune support can reduce the incidence and severity of infections, resulting in reduced costs connected to veterinary care and failure to perform in competitions and races. The specific beta-glucan structure, beta1,3/1,6-glucan is known for its ability to modulate immune response in human and various animal species, however equine studies with dietary beta-1,3/1,6- glucans are scarce. Recently a long-term study in high performing race horses showed the efficacy and safety of a beta1,3/1,6-glucan as a feed supplement. An association between exercise and immune function has already been recognised for decennia, as it was reported that high performing athletes were more sensitive to upper respiratory tract infections. Exercise can be seen as a kind of stress, which can significantly influence the host’s immune response and, therefore, its susceptibility to infections. Stress hormones such as cortisol and catecholamines are typically released during exercise and have been shown to inhibit the immune response1 . The level and duration of these metabolic and hormonal changes influence the period of immune suppression2 . Also in race horses, it is widely recognised that high performing horses are more sensitive to respiratory infections. The reason of this increased susceptibility could be related to both their immune status as well as an increased risk of viral exposure to infected individuals3 . In a study, using a treadmill-based exercise protocol, it was shown that ponies subjected to high intensity exercise were susceptible to influenza virus infection while non-exercised controls were protected4 . Despite numerous studies defining the relationship between exercise, the immune response and diseases, the results can be rather contradictory and complex due to the variable nature of the exercise itself, the complexity of the immune system and individual differences. Factors which are involved are (i) intensity, duration and type of exercise; (ii) acute exercise versus training; (iii) analysed immunological parameters; (iv) timing of measuring immunological parameters after completion of the exercise bout; (v) age, gender, athletic predisposition and breed of the individual animal5,6. It is also very important to distinguish between different types of exercise. Routine training has a beneficial effect on the immune system, wherein more experience and an improved condition of the horse could reduce the level of stress related to exercise. Training can significantly modify both the resting immune function and the response to acute exercise7,8. Whereas untrained horses show immunosuppression after acute exercise and overtraining of horses can result in prolonged suppressive effects. Horses following an 80 km endurance race showed a prolonged suppression of the immune response that lasts several days post exercise9 . Explanation of the long term suppression of the immune system might be multifactorial, but the endurance horses showed a high serum cortisol response during relative long period of exercise. As transport has been associated with rises in cortisol, transport of horses to and from competitions have to be considered as an additional stress factor. Depending on earlier mentioned multiple factors that influence the stress level of exercise, it is believed that an open window for infectious agents persists for 3-72 hours after exercise. So far, no data is available concerning the influence of oral beta-glucan supplementation in horses. Having seen the effect of exercise on immune function and increased risk for viral exposure on shows and competitions, sport horses are an interesting target group. Recently a double-blind placebo-controlled study was performed to investigate the immune modulating effect of beta-glucan in race horses during the summer competition period. The main objective of the study was to examine the immune response in French trotter horses supplemented with or without high quality beta-glucan* by measuring antibody response against a viral vaccination. Secondly, to verify the safety of prolonged supplementation of beta-glucans in competition horses. A total of 32 horses completed the 90 days trial; 16 horses in the control and 16 horses in the beta-glucan group. After 47 days of supplementation, all horses were vaccinated against rabies and received a booster vaccination three weeks later. Vaccination response was evaluated at day 45, 68 and 90. As shown in Figure 1, all horses were sero-negative at day 45. Three weeks after the first vaccination there was a tendency (p=0.1) for higher rabies antibodies response in the group of horses supplemented with beta-glucans. On day 90, mean levels of antibodies were significantly higher for the horses in the treatment group (Figure 1). Other immunological variables as serum IgG levels and different white blood cell counts did not differ between the groups. Other safety variables were examined every 45 days. At day 0, day 45 and day 90, body weight, body condition score, hematobiochemical analysis were performed, individual racing performance and the daily reports of the trainers on any possible adverse effects were checked. No adverse events were observed in any group. All variables related to safety were similar and within the normal physiological levels in both groups. The race horses were in good health and did not show any sign of overtraining or impaired immune function. At day 0, 45 and 90 the horses had to perform a standardised exercise test to evaluate the health, physiological responses to exercise and fitness of the horses. After 45 days of supplementation a positive trend was observed in the supplemented horses. 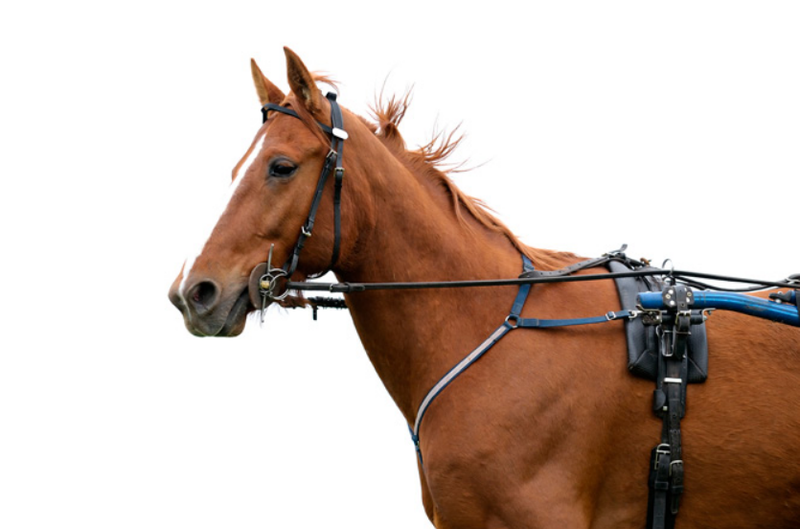 Horses in the beta-glucan group tended to achieve a higher speed before they reached heart rates of 200 beats/ min (V200) and plasma lactate of 4 mmol/L (V4) during the exercise test. Beta-glucans are efficient in the activation of both the innate and adaptive immune system11. If many studies with beta-1,3/1,6-glucans describe the stimulation of the non-specific immunity, similar results on stimulation of the specific immune system and the adjuvant effect (i.e. the enhancement of the specific immune response against co-inoculated antigens) by oral supplementation of beta-1,3/1,6- glucans are seen in other animal species such as aquaculture12,13, poultry14, pigs15 and dogs16,17. Several studies from the United Kingdom, United States, Australia and New Zealand found that respiratory infections are the second most prevalent cause for losing a race and poor training performance in the thoroughbred industry after musculoskeletal injuries18. During the beta-glucan trial, the horses did not show clinical signs of respiratory infections and this might be related to the dry and hot summer period with low natural pathogenic pressure. Seeing the improved immune response to the viral rabies antigen, beta-glucans might be interesting to consider in periods of higher pressure of infection. In human marathon athletes oral supplementation of beta-glucans maintained the immune function and supplemented athletes had a lower incidence of upper respiratory tract infections compared to the control. Maintenance of post-exercise immune function was associated with improved mood state, including reduced fatigue and increased vigor/ energy in athletes19. These results are in line with the positive trend observed in the beta-glucan supplemented race horses by finding higher V200 and V4. Research also suggests the benefit of beta-glucans in breeding horses. Instead of oral supplementation, Krakowski et al20 tested the immunostimulating effect of beta-1,3/1,6-glucans by intramuscular injections to pregnant mares 4-6 weeks before foaling. Stimulation by beta1,3/1,6-glucan significantly increased IgG and IgM in colostrum. Compared to the control group, foals from mares receiving beta-1,3/1,6-glucans showed a significantly improved innate immune response by higher phagocytic activity and index directly after foaling. In a more practical approach; many equine veterinarians are interested in optimising their vaccination protocols, mainly concerning influenza and herpes viruses, but also in case of dermatological fungal infections. The viruses are major pathogens in equines with particular impact in sport and race horses. Vaccination would be optimal to prevent infectious disease; unfortunately most vaccines do not provide full protection to the horse. Even without total protection, vaccinations (e.g. for equine herpes virus) are advised by veterinarians to control the clinical signs and limit shedding of the virus. This is mainly the case for foals, yearling (groups), young horses starting up their training and horses with increased exposure to pathogens, like show and competition horses21. Especially in large stables or herds with (young) horses, these vaccines reduce the pathogenic pressure in the group and reduce the risk of severe outbreaks of the disease22. Beside the extensive economic losses, infectious outbreaks give a lot of misery for the owner and the horses themselves. By improving the immune status and response to vaccines, beta-glucan supplementation can be of benefit for many horse owners, from managing breeding stock to starting horses in competition. This recent study in race horses shows the efficacy of oral beta-1,3/1,6-glucan* to improve immune function. Immunological changes due to exercise and increased risk of viral exposure increase susceptibility to viral infections in horses during competition season. 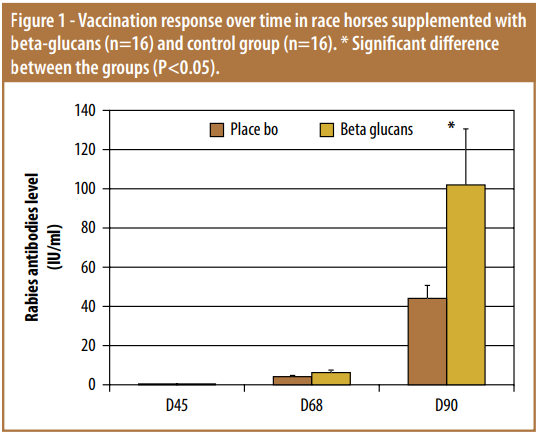 Supplementation of beta-glucans to race horses improved immune response against viral antigens, measured by antibody response after vaccination. Furthermore the study shows that longterm supplementation of beta-glucan is safe and has no impact on any haemoto-biochemical variable or physiological data during exercise and performance.